The planning vs. action debate keeps popping up. So how do we balance the two for the best outcome? The planning vs. action debate keeps popping up. I’m usually pretty neutral in a debate because I love to look at things from both sides. In this debate, I really do see the benefits of planning (ahem – that’s what I do, I help entrepreneurs strategically plan to reach their goals! ), but nobody reaches their goals without action! The two go hand in hand, and a combination of planning and action is usually the best approach. Obviously, endless planning without taking action is pointless, but taking blind action without planning means you have no idea where you’re going. It’s vital to strike a balance between the two in order to get the best results. So how do we do that anyway? How do we balance planning and action? Some of us are more comfortable in the planning phase, and some of us are more comfortable jumping right in. It’s that whole dreamer vs. doer theme coming up again, right brain vs. left brain. It’s hard to balance both when we lean more in one direction than the other, and trying to change that can make us feel uncomfortable. 1. Know yourself. Are you more of a perfectionist or are you impulsive? Are you likely to over-plan or do you love to jump in head first? Awareness is important. If you know what your tendency is, you can get better at recognizing when you might want to pause and consider the other side of the coin. 2. Make sure that what you do matches the task at hand. You wouldn’t spend ages planning little tasks that you can just jump in and do, and you wouldn’t jump right into major decisions without doing a little planning first. Always feel out the situation and use your best judgment to determine how much planning is appropriate. Ask yourself this question: would the planning take longer than the actual task at hand? 3. Plan the planning process! I know some of you are rolling your eyes, but hear me out on this one. If you follow a structured planning process and then move into action once you’ve completed it, it keeps you from staying stuck in the planning phase. It helps to follow a process because you know what outcome to expect from the planning phase. This gives you a framework to follow that keeps you moving forward into action. Not so crazy, right? 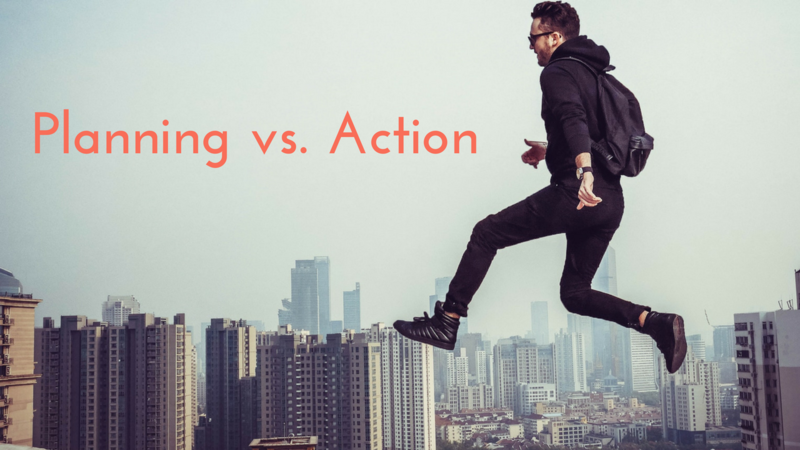 If you ask most entrepreneurs to pick one or the other, they would usually pick action over planning, and I don’t disagree with that. But my whole point here is this: why do we have to pick one? We can and should do both. Balance is a good thing. Megan Bergeron is a success strategist and coach for entrepreneurs who are passionate about creating businesses and lives they love. After burning out from her corporate gig, she decided to seek out more passion and purpose in her life. She now uses the skills she's gained throughout her career and her own personal experiences to help entrepreneurs create road maps for their success. She's passionate about helping them build and grow their businesses and create the lives they want. In a nutshell, she helps entrepreneurs succeed on their own terms.